Using printer color profiles (ICC profiles) is actually quite easy once you visualize the short process. It may sound simple, but this is a critical step. Printer profiles are specific to the printer, paper, and ink that you’re using. They contain the printing performance data of those items combined. Using the wrong profile will result in poor print quality. Installing a profile is nothing more than placing the profile into the right system folder on your computer. (A system folder is one used by your operating system to do its job) Once they are in the correct folder, any compatible program like Photoshop or Lightroom can see and use them. In Photoshop or Elements, this is done with a drop down option in the print dialog. With Lightroom and Aperture, simply choosing a profile name in the Print Module does the job. Provided you installed the profile correctly, it will be visible inside the printer profile drop down menu of your photo software. The list of profiles will likely be large, as it is displaying profiles of all types (not just inkjet papers) in this list. Scroll down in the alphabetical listing until you see your profile. When using a profile, you have to match the printer settings used when the profile was first made. This mostly refers to the media type selection. All profiles should come with a setting guide that tells you which to choose in the printer preferences menu. Tip 6 – No, you will not see the printer profile name in the printer’s media selection list! The media selection (paper selection) is a fixed list that only contains the names of papers made by the printer manufacturer. Usually, you will choose media selection that is close to the inkjet paper you’re using. For example, Red River’s UltraPro Satin uses the Epson Premium Luster or Canon Photo Paper Plus Semi gloss setting. Again, check your profile’s instructions for help. Because you’re using a printer profile to drive the color output, your printer must be told to turn off its color management. In some cases, this may be automatically done when you set your photo software to use a printer profile. Because this is a critical step, double check it each and every time you make a print to save paper, ink, time, and frustration at bad output. Spectrum Expands For Color Blind Photographers! I’m sorry, but I’m confused. You say “Installing a profile is nothing more than placing the profile into the right system folder on your computer.” What is the “right” system folder. I went to my C: drive and looked for a System folder and found four: System, System32, SystemApps amd SystemResources. Obviously I need help in finding the right folder into which I would place the ICC profiles. 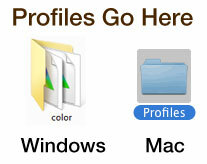 Then I need more specific advice on placing the profiles into the correct folder or subfolder. Since Canon Printers are part of the small circle of pro ink jets and many people print with Canon Print Studio Pro, you should also talk about which software where drives the color profile (its not as simple as “Photoshop does it, turn off printer management…”). Great paper and great support Red River. I’m new to RR. I just received my sample packs yesterday, and I’m excited to give them a try…! Question: Which will be better (if either) the profiles you guys generated, or those I make with my Colormunki Photo…? Thanks for trying Red River Paper! You ask an excellent question. Usually, profiles that are specific to your printer will make more accurate prints. As iy know, Red River Paper profiles are generic in that our printer will probably not perform exactly like yours. However, our profiles are made by Chromix using 926 patch print targets. This makes RRP profiles large and a higher “resolution” as compared to ColorMunki profiles. I would start with Red River profiles and then maybe make one with your Munki if you want to try a comparison. I know you don’t provide profiles for us that are using HP printers. Do you have a best guess solution we could use? If you do not have one of those models, the best results will come from the printer managing color. Just choose the media setting we recommend and choose best photo quality. HP printers have excellent printer color management software and the results are usually excellent. I use Corel Painter 12 and Corel Paintshop Pro X3. I use a Canon Pro 9000 Mark II. You keep referring to Adobe Photoshop programs. Does anyone there have help for Corel users? It seems to me that I made a bad choice(Corel)as everything on the web seems to favor Adobe. I really like Corel better. I have Elements 11 and much prefer my Corel programs. I’m sure there are a lot of Corel fans out there. How come no references for them? I do like your papers, and refer them to friends. I just wish you had instructions specific to Corel. Paint Shop Pro does not have the ability to use printer color profiles for output. You can use Windows’s ICM system to print using a profile though. Email advice@redrivercatalog.com and we can help you walk through the process. I use PaintShop Pro (X8, at this point) with the same Canon 9000 as mentioned. I find color profiles under files/color management. I am reasonably sure it was in version 4, which I think was where I started, and for all I know, was in the software all along. Though I must admit to feeling left out now and then by the Adobe crowd, I have found PSP capable, indeed, more capable than I am. It also has its quirks, but I am in the software business and long ago gave up on the idea that a software exists that always does what I want without some fuss and bother. There is a large community for PSP which includes professionals, and there are numerous tutorials on the web for PSP color management–though, of course, I am sure quality of the presentations varies. The http://creationcassel.com site, as mentioned by S. Blazer, looks interesting. FWIW, I have also worked a little using the profiles in Windows ICM as in mentioned by Red River. I suppose it is just a matter of picking which path you prefer. I, like you, prefer Corel, now using PSP Ultimate 8 after graduating from their first program. It does so many more things than I use it for and after many years of being self taught I found a site listed at the bottom of one of the Discovery email’s. It is called (I think) Cassel Creations. It is a digital scrapbooking site but also is useful for photography. They offer video and written lessons on using PSP. I also find the Discovery video’s helpful. If you are not signed up to receive those I suggest you do. Hope this helps. Your paper is outstanding and the help you offer is remarkable. I have had great experience with Red River Paper. Thank you. I havn’t use Red River paper yet–but I will now because of the support and great tips. These are great tips! They increase my confidence in using a variety of Red River papers and also help me to get the most from profiling my printers. Thank you. Any help in using paper profiles with Windows and Corel Paint Shop Pro X2 as the image management program? I am so pleased to have found your paper solution combination. The alternative to buy an expensive printer analyzer is not a good solution for me and I am ordering your kit to get started with my new R2000 printer. I have been using Red River paper for 3 years and love it thank god some one recommended it. Have been a user ever since. You metallic paper rocks it is so awesome. could you talk about getting better black and white prints. My black and white always come out with a color cast. I’m fairly new at printing with papers other than HP on my B9180. This was valuable information for me. ON a side note I am disappointed that RR does not make profiles for printing on HP glossy paper. Thanks for the great information on profiles. And thanks for having such great paper!